On this day of initially planned Brexit, the Visegrad 4 consortium organized a day of training on Marie Curie Actions in various representative houses of the EU commission. 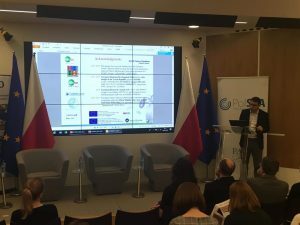 In that occasion, T. Derrien was invited to provide a feedback from his experience with the Horizon 2020 Marie Curie Actions on Individual Fellowship, and RISE program. Final program of the training is available here. 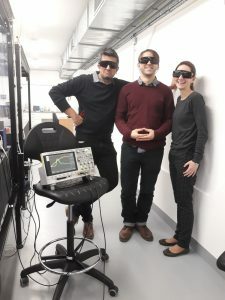 The ATLANTIC project of the European Commission stands for developing an “Advanced theoretical network for modeling light matter interaction”. Since March 1st 2019, the ATLANTIC project, which aims at developing an international network and regular exchanges between theoreticians of laser materials interaction all around the world, has started. The international consortium is composed of 11 countries including 6 members of the EU (Bulgaria, Ireland, Czech Republic, France, United Kingdoms and Germany) along with 5 non-EU countries (Japan, Russia, Bielorussia, Argentina and Uzbekistan) for a total of 13 participants. The Bulgarian group is coordinator of the project. and Prof. Tzveta Apostolova (New Bulgarian University, Bulgaria), coordinator of the project. The project looks forward to ensuring highest standards in term of scientific quality, ethics and diplomacy in view of training future generations of scientists with the best human and scientific standards. The consortium will meet at the New Bulgarian University (Sofia, Bulgaria) this week, for the project kickoff meeting. A new website will be opened for the ATLANTIC project soon. Today, I submitted my application for ERC starting grant! Of course, I won’t disclose the topic for now, but it is exciting to have applied ! If granted, I would get 2 PhD students and 2 post docs over 5 years. Finger crossed! Going back to writing the pending publications. Click on the picture to access the publication. 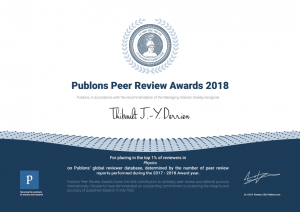 Outfalls of the Publons.com award has brought attention from an impressive freelance scientific journalist (Dalmeet Singh writes articles for most prestigious journals like Science, Nature, …) who kindly invited me to contribute to his article via giving an email interview about the peer review process. It resulted into a rich article that has been published in Undark Magazine, an american journal that is funded by the Massachusetts Institute of Technology (MIT, USA). The resulting article about peer-review can be found here. The public summary of the project has been published on the EU server CORDIS. The link is also available in the menu bar of the website, in the section “Publications”. After having reported these results in international conferences (AES 2017 South Korea, COLA 2017 France, Ultrafast Optics 2017 Moscow), having been published in Czech public media (Novinky.cz, Technical Weekly CZ, Ceske Televize 24), it was time to report this success story at the HiLASE Centre (FZU Prague). The seminar duration was 45 minutes and the time was shared between T.J.-Y. Derrien, Y. Levy and I. Mirza. Seminar abstract is available on the HiLASE website: PDF.